• Inputs data and commands. Your computer consists of hardware which requires the use of Software to function. One is unable to work without the other. Hardware - The physical parts of your computer that you can touch. Click here to read my Cheap Computer Hardware Guide. Software - Enables you (the user) to instruct the computer to execute specific tasks. Click here to read my Cheap Computer Software Guide. The case houses all the computer components. 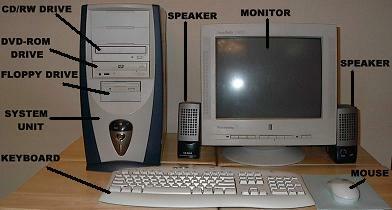 The two most commonly used case designs are the desktop and the tower. Click here to view my Cheap Computer Case Guide. Tower - Designed with a vertical case and has more space than the desktop to be able to install additional hardware. Desktop - Designed to sit on a desk horizontally. Workstation - Networked to other computers and has more speed, memory and storage capabilities than a desktop. Can also be a stand-alone computer. Notebook/Laptop - Portable computer that has the same capabilities as a desktop but is small enough to be taken from one place to another. Tablet - Uses an electronic stylus to write on the screen. PDA - Personal Digital Assistant. Small personal computer with limited capabilities. A Personal computer (PC) is for a single-user and is generally used for word processing, spreadsheets, applications, desktop publishing, multimedia and management of databases. The two most popular computers are the IBM-compatible PC and the Macintosh. We all need the computer - regardless of our age! It has definitely become an integral part of our daily lives. We just can't do without it! .... can we? Click here to learn how to build your own cheap computer using cheap computer parts. Return from Computer to Cheap Computer Home Page.